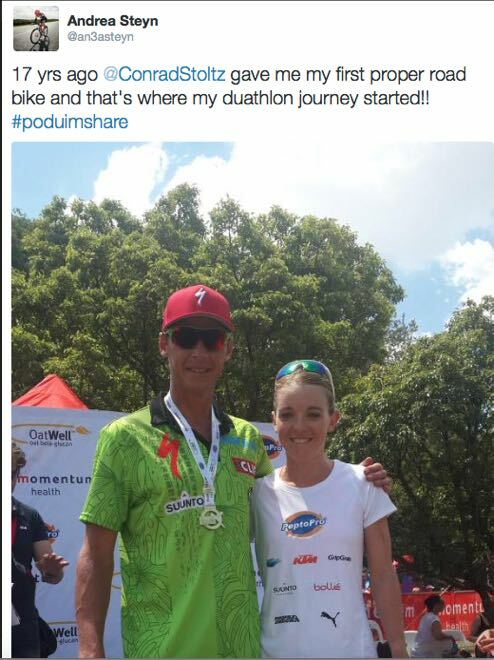 Momentum Health OatWell DualX powered by PeptoPro held at Hakahana, Pretoria. 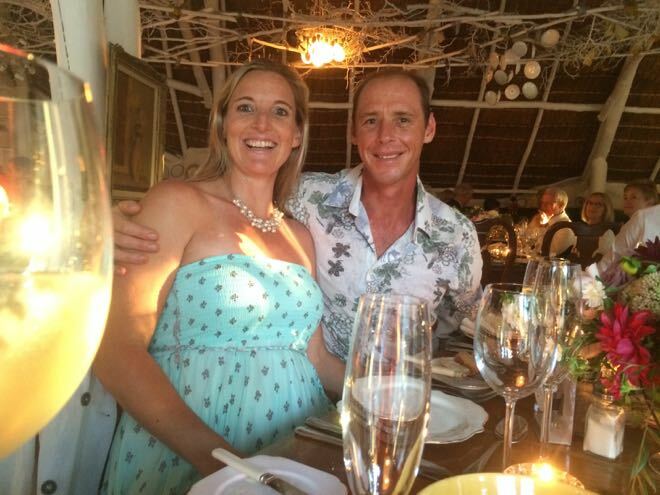 Quality pix by Zoon Cronje. The rest- probably mine. The other great thing about spending my first winter in South Africa (since 1991) is now I can do the interesting local races I’ve been missing out on. 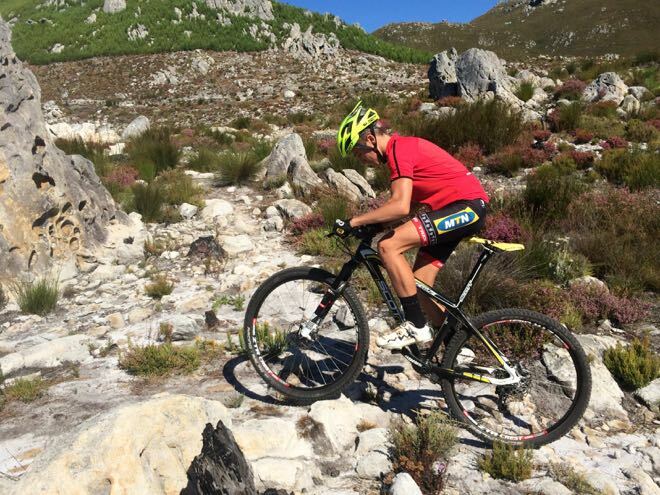 Been following the DualX off road duathlon series from across the ocean via the interwebs and vicariously through Theo Blignaut. 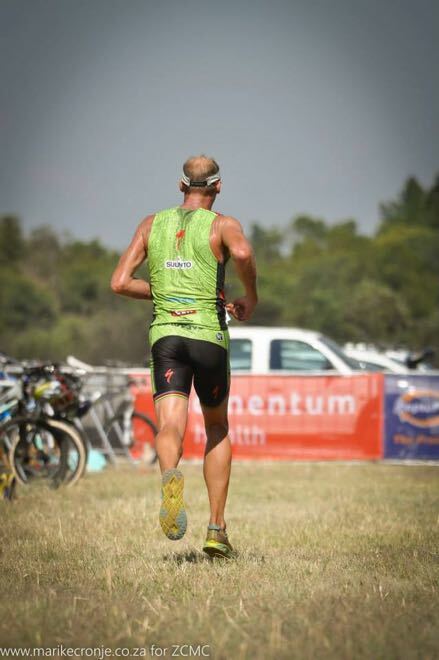 I’ve heard about the fantastic Advendurance organization, decent prize money, “real” run and bike courses… but mostly I heard of the “unbeatable Brand du Plessis.” I didn’t realize exactly how unbeatable until I learnt he hasn’t lost an off road duathlon in 6 years. but also mixes it up on the podium with the MTB Pros. And World Marathon MTB Champ 35-40. Other then “gooi mielies Pappie!”, I didnt have a strategy. Brand burning us off in the opening 200m. 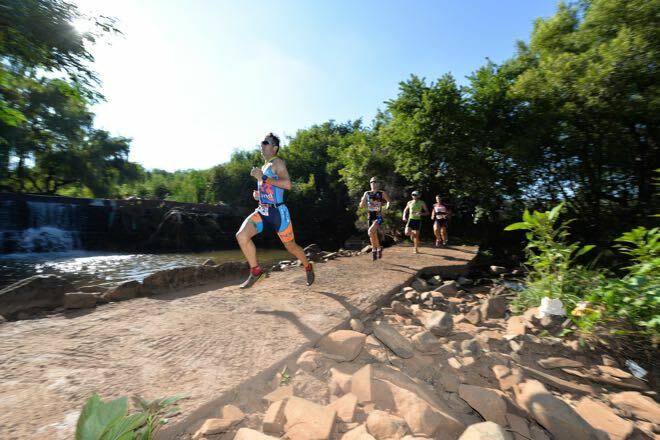 [The highly anticipated showdown between duathlon racing star, Brand du Plessis, and multiple Xterra World Champion, Conrad Stoltz, played out in spectacular fashion at the first leg of the Momentum Health OatWell Dual Cross, powered by PeptoPro near Pretoria at the weekend. 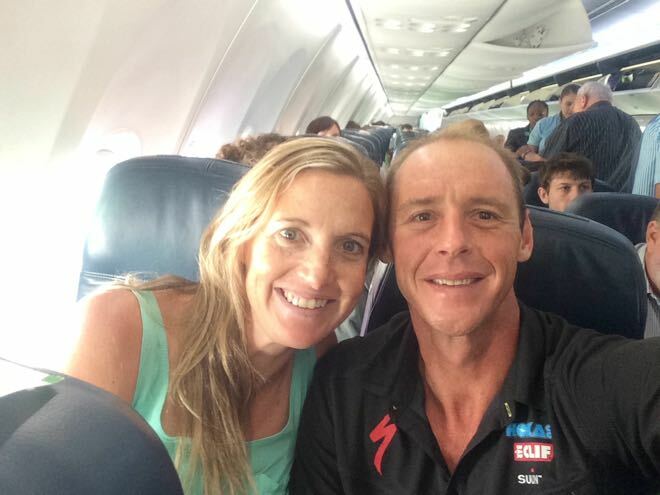 Stoltz was admittedly anxious about tackling Du Plessis on his home turf and at altitude: “I Googled Brand and I knew he would put 1-2 minutes into me on the run, so it was always going to be a challenge,” said Stoltz, who lives in Stellenbosch when he’s not racing abroad. 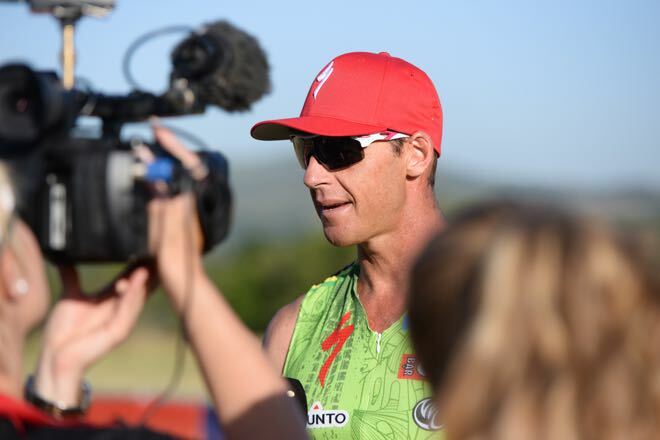 As expected, it was Du Plessis that fired the first salvo, setting a blistering pace ahead of the experienced Stoltz on the first run over five kilometres at the Hakahana Trails venue, just west of Pretoria. I got on the bike I thought “ok, time to tango” – but despite allowing for a 10% lower Wattage reading due to the 1500m altitude, the Ws were lagging as my legs were more than a bit dented by that unfamiliar first run! 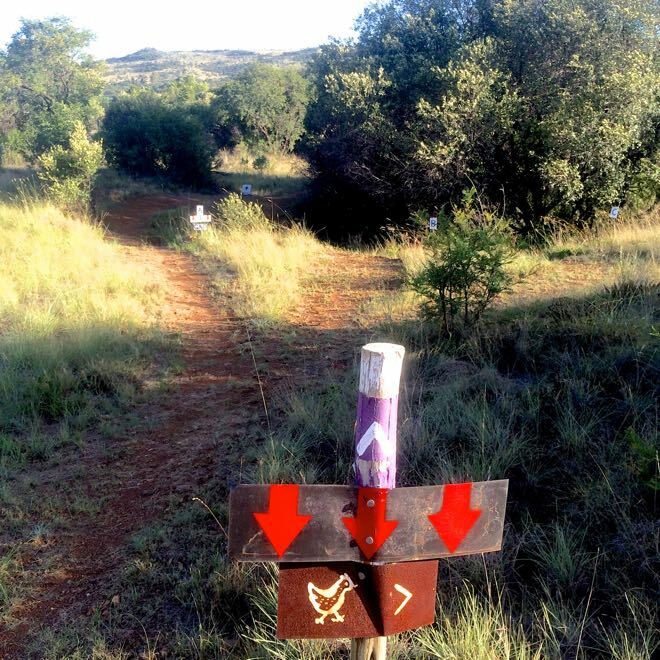 As advertised, the 30km bike course was “real.” The Hakahana bike park part, very well designed, and the rest- anything from “hectic rocks, berms and cheeky gap jumps” to fire roads with sections of “ZEBRAS, GET OUT THE WAY! !” It was also quite hot. Like 32C. Not a cake walk. [“After I caught up to Brand I waited for the flat sections to attack him, seeing I’m double his size and probably couldn’t outclimb him,” explained Stoltz. “Then I noticed he was on a hardtail frame and realised he’d brought a knife to a gunfight! 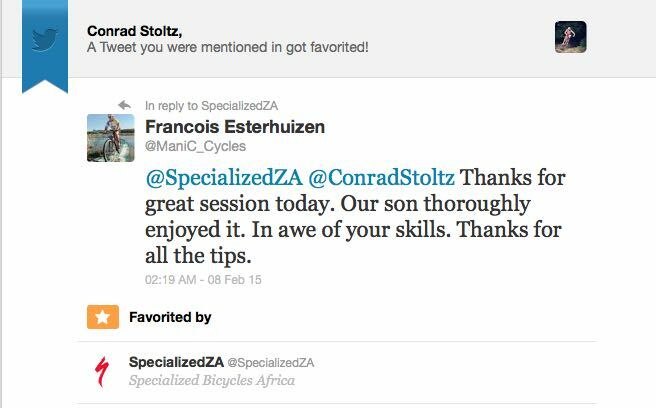 “The course was super rocky and my Specialized Epic dual suspension was way better suited to this terrain than his hardtail. It was a very fun course but I’m sure half the rocks on earth were dumped in this one location, which suited me perfectly,” he smiled. Good thing I didnt have to do any spectacular running on the closing 2.5km leg- my legs were hammered! 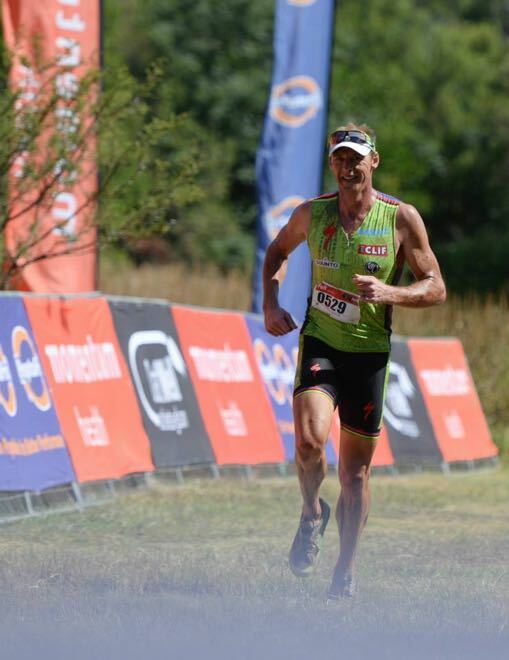 Felt good to do my form justice, regroup and clear my head after the huge disappointment of running off course at XTERRA Buffelpoort. Was refreshing to race guys I’ve never raced before. 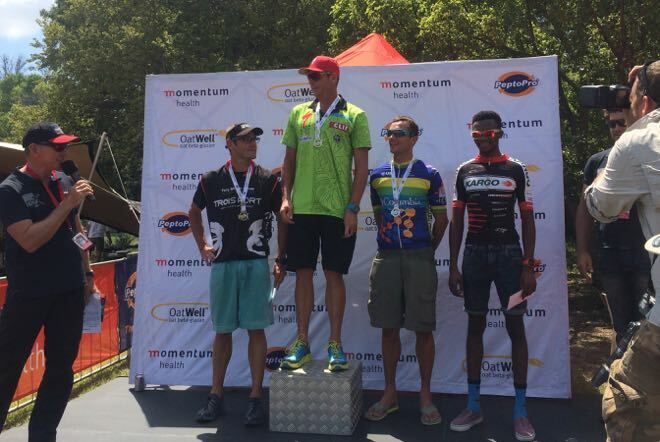 I’ve been following Diepkloof MTB and Kargo MTB team recruit William Mokgopo JNR (far right) via twitter, @weeleeyumJNR but didnt recognize him when he ran up the mountain like a goat. I thought ‘skinny runner, probably can’t bike’ and let him go, but only afterwards realized he’s actually “skinny cyclist, CAN run!” Too bad he’d forgotten his MTB shoes at home and rode with running shoes… I’ve learned, when driving to a ride, always think “Helmet, shoes, chamois” before turning the key. 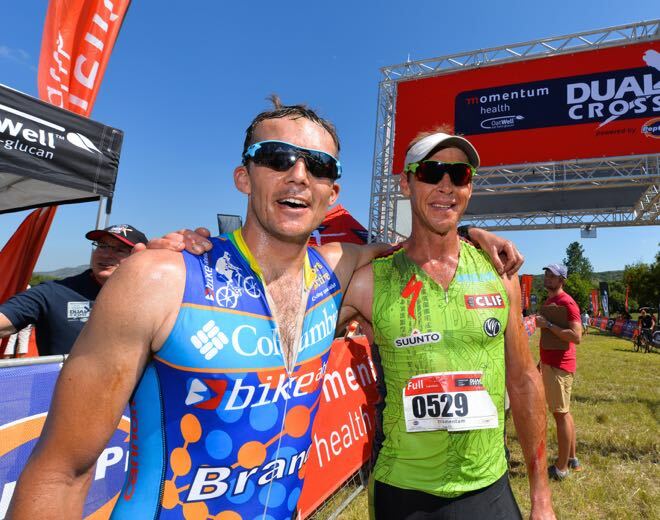 As a professional athlete, part of the allure of the 4 race DualX Series is the TV coverage. Seven shows of 30 min for each of the 4 races. 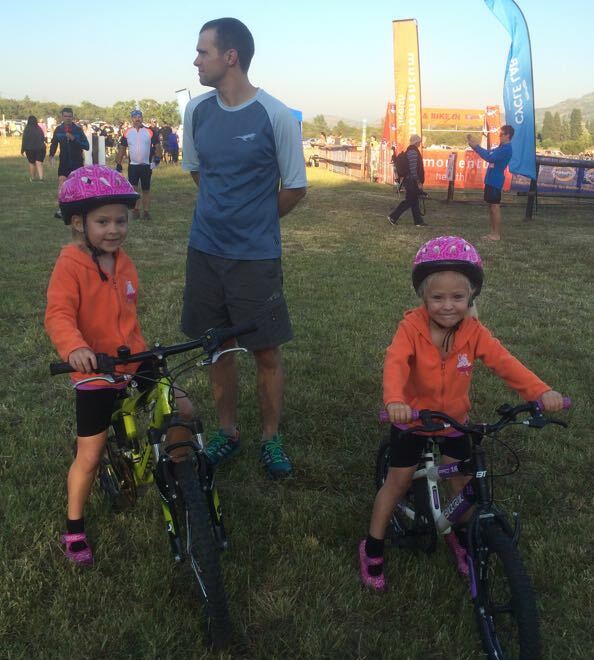 What I also found refreshing at the races was the 1300 participant turn out, 4 distances with matching skill levels of racing- from kids to Pros. No overlapping of courses. I especially enjoy the family atmosphere- myself becoming a daddy soon, I now look at little girls differently, taking notes on whats hot and whats not… Also how to try camouflage the “proud daddy” look. I was doing talent ID with NTvl Triathlon in the 90s, and saw a little Andrea Steyn (then Horak) run along without quite touching ground, I told them: “Pick this one!” Together with my mom, (NTvl prez back then) we helped her with a development sponsored road bike, some guidance & encouragement (such as: school running coach wanted to ban cycling), and since then we’ve watched her set the duathlon and triathlon scenes alight. Really satisfying stuff. 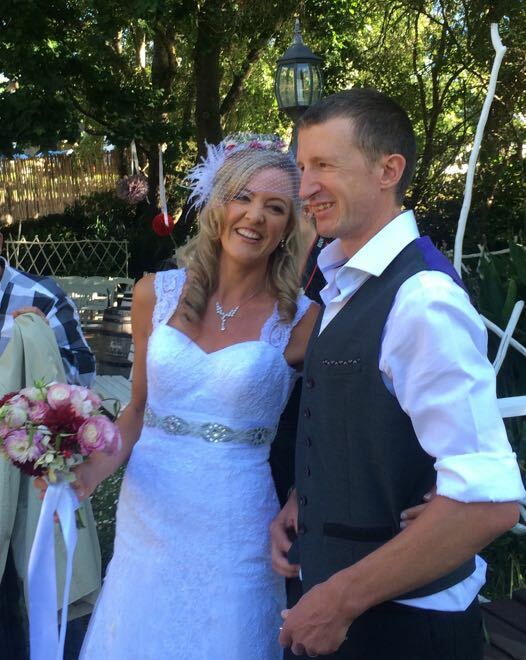 But the racing wasn’t quite over- we had Jan and Marlize’s wedding to catch at 4pm. In Stellenbosch. That’s at the far end of the country. I “showered” under a bucket while #PrincessHotstuff packed my bike, and with tyres smoking (and rental car not refueled) we just made our flight to Cape Town. Fortunately the pilot also smoked tyres and we got there early. So we didnt have to dress for the wedding in the car. #PrincessPregnantStuff and #Not-so-Caveman relaxing with friends- once the smoke settled. The next morning dark o clock I needed a few extra coffees to be awake and mobile enough to teach a small but eager group Caveman MTB Skills on the XTERRA Grabouw bike course. After an action packed weekend (you only live once!) 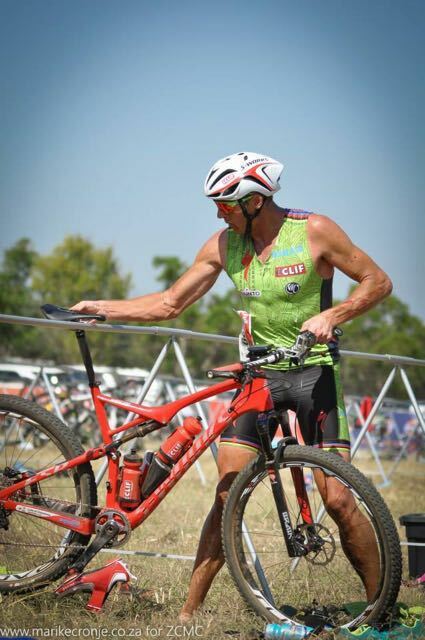 its back to the grinding stone – preparing for XTERRA Grabouw and looking forward to the rest of the DualX Series. This entry was posted	on Monday, February 16th, 2015 at 7:58 pm	and is filed under Blog Entries. You can follow any responses to this entry through the RSS 2.0 feed. You can leave a response, or trackback from your own site. You probably have more people reading your blog then you know. I love reading it. Thanks for posting and congratulations on becoming a father. Your race report is read and was enjoyed! The cut and paste added to the flavour of it. Good luck in your preparations for Grabouw. Keep the posts rolling, like the specialised wheels. An academy may not be a bad thing indeed.